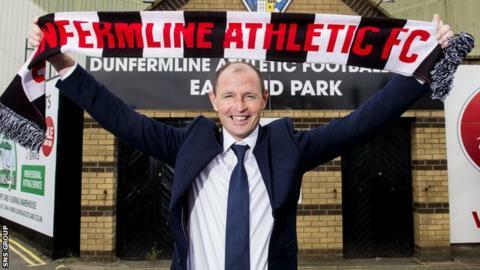 Former Kilmarnock boss Allan Johnston is the new manager of Dunfermline Athletic, signing a one-year deal. The Scottish League One club recently announced that John Potter would be stepping down from the manager role to his former post as head coach. Neil McCann, who started the season as assistant to Potter's predecessor Jim Jefferies, is leaving the Pars. "The club is forward thinking, they obviously want to achieve success. It's the perfect fit for me," said Johnston. Johnston, 41, won Scotland's third tier and promotion with Queen of the South in 2013 and then joined Killie. However, he left Rugby Park in February a day after announcing his intention to depart at the end of the 2014-15 season. Johnston was upset that forward Robbie Muirhead was sold to Dundee United on transfer deadline day, saying: "I never found out Robbie was away until five past 12 [midnight]." The former Scotland international played for both Queens and Kilmarnock as well as Hearts, Rangers, St Mirren, several English clubs and Rennes in France. Dunfermline, one of only two clubs with full-time playing staff, started the season with Jefferies in charge and were favourites for the title. However, the former Hearts and Kilmarnock boss resigned in December, with Potter taking over, and finished the campaign in seventh place - 11 points adrift of the play-off places. Johnston told BBC Scotland: "I was interested in the job, I put in my CV, and I got the interview, so absolutely delighted to get it. The size of the club there's always going to be people interested. "I thoroughly enjoyed me time at all the clubs I've been at. Queen of the South, really successful. Kilmarnock, I think I left them in a good position. "The main focus is Dunfermline now and obviously try and achieve promotion." The East End Park club are now community-owned club in 2013 following administration.